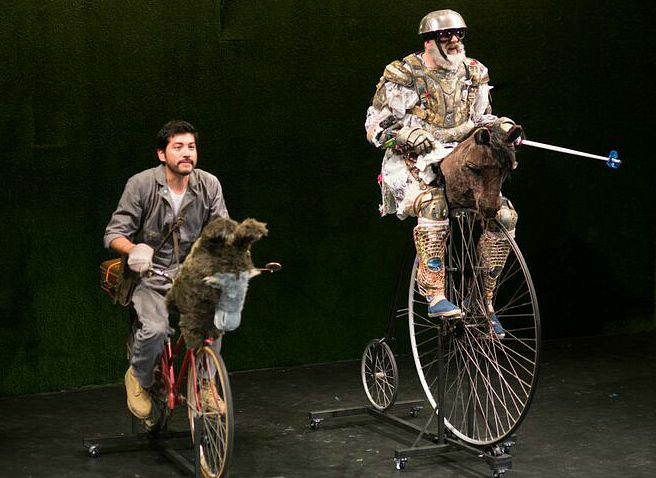 Don Quixote rides again – in a world-premiere adaptation commissioned by Amphibian Stage Productions in Fort Worth. In his review, KERA’s Jerome Weeks says this is a more contemporary treatment of Cervantes’ classic tale of the crazy old knight and his sadsack sidekick. Don Quixote de La Mancha, written at the time of William Shakespeare, remains a masterpiece because — like a number of Shakespeare’s plays — it can still crack funnybones and break hearts. The same might be said of the new Amphibian adaptation by Brenda Withers — except the heartbreak in this case comes from watching so much inventiveness and talent go into a would-be whimsical production that doesn’t click. It doesn’t make you really laugh, chuckle a few times appreciatively, maybe, or, for that matter, it doesn’t get you dreaming some of those impossible dreams. I honestly regret that last line — which, of course, is from the Broadway musical, Man of La Mancha. But unfortunately, in America, it’s hard for any Quixote adaptation to escape that particular truncated, sentimental wallow (and one wonders if playwright Withers is slyly mocking it or invoking it, the number of times the terms “impossible” and “dream” pop up in her final scene). There’s so much more in Miguel de Cervantes’ epic, big-hearted novel, one wants to ignore La Mancha completely. But the basic story outline remains the same as the musical’s: A demented old man reads too many medieval tales of chivalry, frightens his friends and family by dubbing himself Don Quixote and convincing the peasant Sancho Panza to be his squire, to join his quest in following the glorious but rocky path of knight errantry. The saintly Duclinea getting her bawdy Bessie Smith on: Christie Vela, right. That’s typical of Withers’ invention and of the sublime-to-the-ridiculous tumbledown the stairs of Cervantes’ humor. In the novel, Cervantes never names the donkey Jorge, and the donkey Jorge/Don Quixote pun works only in English. In Spanish, donkey, of course, is burro. 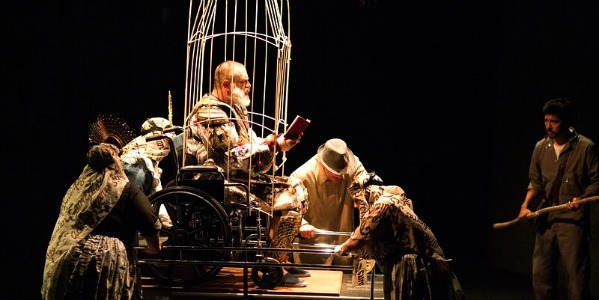 Withers, a founding member of Cape Cod’s Harbor Stage Company, has made Quixote contemporary — the play starts with Alonzo Quixano unconscious, rigged up in a hospital bed — but it’s still more faithful in spirit than Man of La Mancha (and quite a few of the many film adaptations). 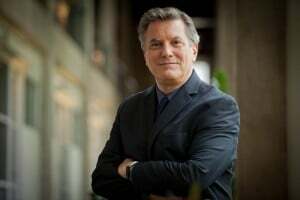 For one thing, Alonzo’s friends and priest soon torch all his deceitful books — with a giant digital-projection fire blazing away on stage — and break into a happy dance. This is the war on fantasy Cervantes saw, the suppression of the escapist — and ennobling — pleasures of literature. Jeremy Schwartz plays the don, and Schwartz has always been a commanding presence on a stage, a great, roaring, comic beast or buffoon. But truth be told, Schwartz is best at characters who are earthbound or earthy, rooted or rutting. Fact is, he’d make a superb Sancho Panza. Quixote, on the other hand, is a dreaming saint, a delightful, woeful, ethereal loon, barely tethered to our world of limitations and necessities. The comedy in Quixote often resides in the don’s crash landings back to earth. And it’s only at the end, when Schwartz’s don is finally, fully earthbound that he becomes truly moving. As Sancho Panza, Ivan Jasso isn’t short or squat — as the character is typically portrayed. 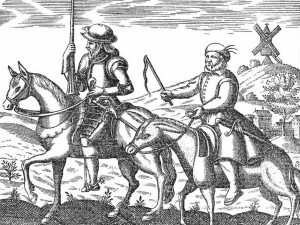 Cervantes never really describes the squire that way, but because Sancho is often motivated by ordinary hunger or fortune-hunting, and because of the inevitable Mutt-and-Jeffyness of the two — Quixote gaunt and riding his skinny nag named Rocinante, Sancho plodding behind on a lowly donkey — even the earliest illustrated editions went for the comic (and class-based) contrast. Hence, a rounder Panza, slower and lower to the ground. The Amphibian show’s best moments are its most flamboyant, its most un-literal yet most theatrical. 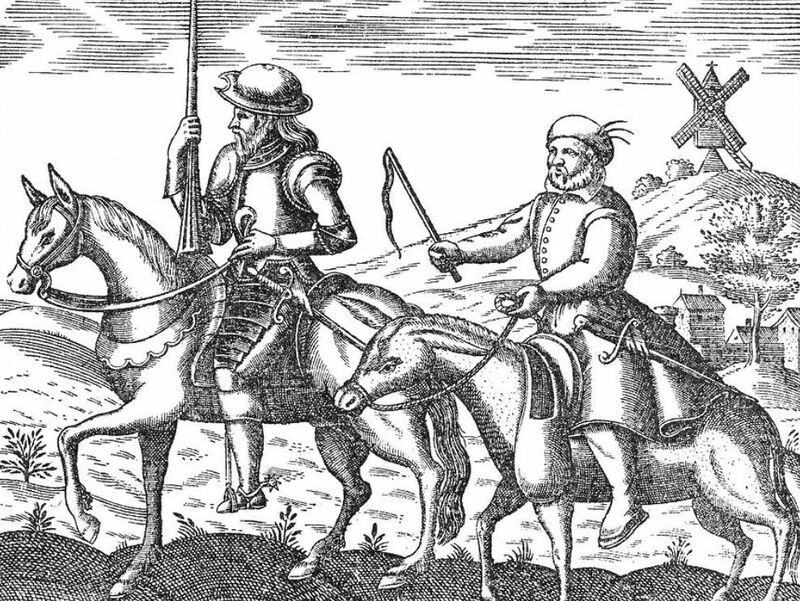 Quixote and Sancho tally-ho off on their quest — but on bicycles. 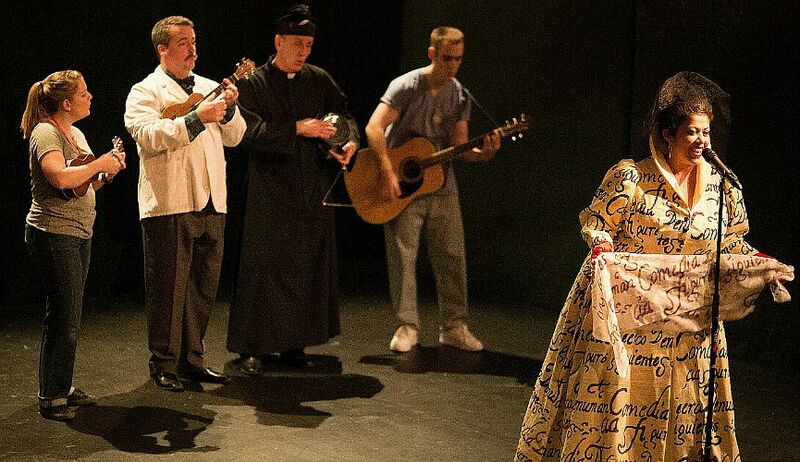 Dulcinea – Quixote’s saintly love, played by Christie Vela – gets saucy with the old Spencer Williams song, “I’m Wild About That Thing,” made famous by Bessie Smith (“Please don’t hold it, baby, when I cry / Give me every bit of it or else I’ll die”). Director Matthew Earnest and his splendid design team do their best to jazz things up like this. There are the animal-headed bicycles, the don’s goggles and ski pole-lance, a human-sized bird cage and a grassy set by designer Sean Urbantke. It has little sconces and pop-out windows in the walls and doors on both wings that allow this three-sided box to swing open with instant entrances and exits. People keep coming and going here, as Alice might say. It’s a fine-looking production; one just wished for more departures from stage realism, more clever cracks in that fourth wall — or even just more uses for a white wall made entirely of ordinary doors (only one door, it seems, actually works as an escape hatch — symbolic, perhaps?). Cervantes’ novel does contain satiric portraits of actual life in 16th-century Spain, but the novel is at heart a fantastical fable warning us — with self-referential tongue in highly literary cheek — against believing fantastical fables. In the second volume, Quixote and Sancho even discover everyone knows them from the first volume. So they journey to Barcelona — the headquarters of Spain’s book industry at the time — to find the publisher and punish him for how they were portrayed. Think of a yarn as knowing and in-jokey as TV’s Arrested Development. But it’s a thoroughly tender-hearted Arrested Development — if properly done. Don Quixote manages to be both a tragedy and a self-aware comedy as it seesaws between the don’s valiant delusions and Sancho’s glum pragmatism. That’s why this show needs more nimbleness and ingenuity, not simply from Withers’ script but more digital projections, more ridiculous theatricality. I appreciate this production may well be Amphibian operating at the top of its technical and design game, but The Quixotic Days and Errant Nights of the Knight Errant Don Quixote almost breaks out at times into the truly grand and goofy. And then it settles back into the merely diverting, at best. ‘Quixotic’ refers to a noble but foolish effort. But in chasing after Cervantes’ giant novel, the Amphibian production is not touchingly, dramatically, windmill-tiltingly quixotic enough. Don Quixote (Jeremy Schwartz) trapped back on earth. The Quixotic Days and Errant Nights of the Knight Errant Don Quixote continues at Amphibian Stage Productions through August 2nd.